Did that snowman just move? Fortnite’s newest update brings a brand new item to Battle Royale, while removing one of its most frustrating weapons. Players can surprise their enemies using the Sneaky Snowman, but it won’t be quite as easy to get around anymore, with reduced spawn chances for Quad Crashers, planes, balloons, and more. A huge in-game event recently brought the undead Ice Legion to Battle Royale and blanketed its entire map in snow. It’s harder than ever to move around without being seen, but not if you’re a snowman. The Sneaky Snowman is a brand new common item that you’ll find in chests, llamas, and on the floor. If you want to, you can just throw it down and leave it be, but the real fun is in wearing it. After throwing the Snowman down, you can press the secondary fire button to climb inside it. You can then navigate your way around while blending into the landscape, though you’ll have to be careful. 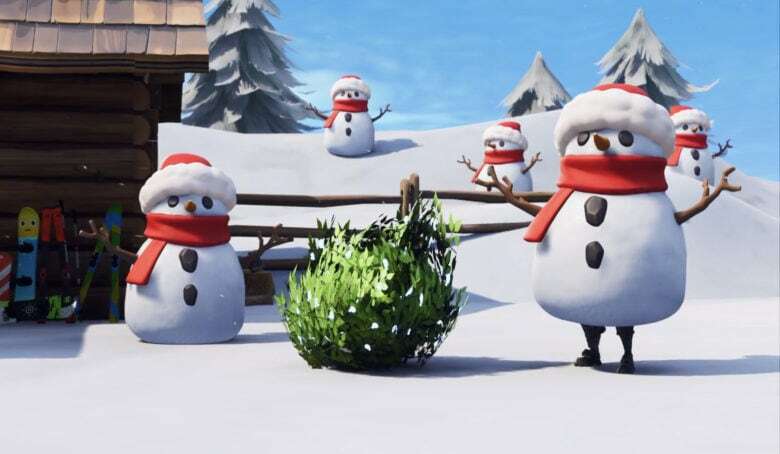 The Snowman will provide you with some protection — it has 100 health and acts as a shield — but you cannot build, shoot, or use other items while you’re inside it. The only thing you can do is move. Switching to another item or entering building mode will remove the Snowman, however, so you will be able to pull out a weapon after sneaking up on an enemy — you just can’t have camouflage and firepower at the same time. The update also removes the Quadlauncher, one of Fortnite’s most frustrating weapons, from Battle Royale. The Port-a-Fortress and Grappler are gone, too, but unfortunately, the regular rocket launcher still remains. Gliders, balloons, Quad Crashers, and Stormwing planes are now harder to find after having their spawn chances reduced. Shield potions are also harder to come by, but you should find more small shield potions lying around. Sniper Shootout, which now includes the new suppressed sniper and the scoped revolver, is this week’s limited-time game mode. For the full patch notes, visit the Fortnite blog. If you’d rather just enjoy the changes, you’ll find them inside Battle Royale across all platforms right now.